In 2014, an estimated 430,000 menstrual regulation procedures were performed in health facilities nationwide, representing a sharp 34% decline since 2010. The annual rate of MR was 10 per 1,000 women aged 15–49 in 2014, down from 17 in 2010. Some 257,000 women were treated for complications of induced abortion nationally in 2014, for a rate of six per 1,000 women aged 15–49. Fewer than half (42%) of public- and private-sector facilities permitted to provide MR services actually did so in 2014 (down from 57% in 2010). This proportion was particularly low among private facilities, of which only 20% reported providing MR in 2014 (down from 36% in 2010). Only about half of all union health and family welfare centres (UH&FWCs) provided MR procedures in 2014, a significant decline from two-thirds in 2010. These facilities are the primary health providers in rural areas, where the majority of the population lives. The decline in the proportion of UH&FWCs providing MR services may be due, in part, to a lack of training among younger providers recently recruited to replace a large cohort of UH&FWC providers reaching retirement age. At UH&FWCs that do not offer MR services, 92% of providers aged 20–29 reported they do not provide MR due to lack of training. An estimated 27% of women seeking MR services at public and private facilities were rejected. The most common reason providers gave for turning women away was having missed the window of time since last menstrual period in which MR is allowed. Many respondents also reported rejecting women for social and cultural reasons unrelated to government criteria. Policy and programmatic actions are needed to increase availability of and access to MR and treatment for postabortion complications. Strategies include increasing training for providers and disseminating information about the MR program at the community level. In addition, provision of contraceptive counseling and methods for postabortion care and MR patients must be improved, particularly at private-sector facilities. Under the Penal Code of 1860, induced abortion in Bangladesh is permissible only to save a woman’s life. In all other circumstances, it is a criminal offense punishable by imprisonment or fines.1 However, menstrual regulation (MR), defined as the “procedure of regulating the menstrual cycle when menstruation is absent for a short duration,” has been available free of charge in the government’s family planning program since 1979.2,3 A government authorization rule regulates MR and lays out guidelines for the provision of MR services, including on the types of providers who can offer the service (doctors, family welfare visitors and paramedics), the types of facilities where it can be performed and the maximum number of weeks since a woman’s last menstrual period (LMP) that the procedure is permitted. Since the 2010 study, there have been several major changes to the MR program, including an increase in the time frame in which MR is allowed, approval of the use of misoprostol and mifepristone for MR and approval for trained nurses to provide MR services. In addition, the context of clandestine abortion in Bangladesh has also changed with the increased availability of medication abortion in the informal sector (e.g., at pharmacies and drug sellers) across the country in recent years. Given these changes and the need to understand ongoing shifts in the delivery of MR and postabortion care services, a new nationally representative study of MR at public and private health facilities was conducted in 2014, providing new estimates of the incidence of MR and induced abortion in Bangladesh.6 Drawing on these data, this report provides new information on factors associated with access to and quality of MR services and postabortion care across the formal health care sector in the country. It serves as an update to the 2010 study, provides measures of access to and quality of postabortion care and MR for the year 2014, and examines trends for the period 2010–2014 for selected measures. Based largely on the national survey of facilities, this report documents the extent of provision of MR and postabortion care services in 2014 by administrative division and facility type, and examines many of the factors that are associated with access to MR and postabortion care. The report takes a health system perspective—that is, it examines these issues based on data from clinic directors or other senior providers and does not directly capture the perspective of women seeking services. It focuses predominantly on public and private health facilities, which is where the majority of legal MR provision and postabortion care occur. NGOs also provide a substantial number of MR procedures in the country, and limited information on total provision was collected from the central offices of all major NGOs providing MR in Bangladesh; however, NGOs were not included in the national survey, so this report is unable to speak to the quality of MR services and postabortion care in the NGO sector. It is also important to acknowledge that many women in Bangladesh obtain MR services from informal-sector sources (such as drug sellers, pharmacies and untrained ayahs), which often intersect with the formal health care system in a variety of ways.7 This survey was unable to capture these influences, but we take them into account in the interpretation of our findings and our recommendations. The next section details the methods used in conducting the surveys on which the report is based. The third section then presents findings in regard to the MR program, highlighting factors associated with women’s access to services and providers’ views on how the program could be improved. The fourth section examines the provision of postabortion care and factors associated with access to quality care. In the final section, we offer recommendations for policies and programs based on the survey findings. This study draws from three main data sources: the Health Facilities Survey (HFS), which collected nationally representative data from of public- and private-sector facilities providing reproductive health services; the Health Professionals Survey (HPS), which collected data from experts with comprehensive knowledge on the provision of MR and postabortion care in Bangladesh; and service statistics from the central offices of major NGOs on the number of MR procedures completed and postabortion care cases treated. Government data on the provision of MR and postabortion care were not used because they exclude services provided in the private sector, and previous work has found that official statistics on public-sector provision suffer from severe underreporting.8 A majority of the data presented in this report come from the HFS; findings from the HPS are limited to the estimated costs of induced abortion, estimated proportions of women experiencing complications from unsafe induced abortion and estimated proportions of these women who receive postabortion care. The HFS was conducted to obtain nationally representative facility-level data on the provision of MR and postabortion care. The survey sample frame included all facilities considered likely to provide either or both of these services in the public and private sectors. Using the most recent Ministry of Health and Family Welfare lists of health facilities in Bangladesh, we identified 5,424 eligible facilities (Table 1). The public sector primarily consists of five types of facilities (listed according to size, in descending order): medical college hospitals, district hospitals, upazila health complexes (UHCs), mother and child welfare centres (MCWCs) and union health and family welfare centres (UH&FWCs). UH&FWCs are staffed by family welfare visitors and sub-assistant community medical officers, many of whom are trained to provide MR services, but these small facilities do not offer postabortion care. * The other four types of public facilities typically offer both MR and postabortion care. The private sector also consists of a number of health clinics of varying sizes. Lists of private clinics were obtained from the central and district-level offices of the Directorate General of Health Services; the research team removed all specialized facilities unlikely to provide MR or postabortion care (such as optometry clinics) from the sampling frame and adjusted the universe accordingly. For sampling purposes, we divided the remaining private clinics into three categories, based on bed count: 1–19 beds, 20–49 beds and 50 or more beds. A stratified multistage sample design was employed for the Health Facilities Survey. In the first stage, a sample of 16 of the 64 districts of Bangladesh was drawn. The number of districts sampled varied by division. Two districts were sampled from each of the Barisal, Khulna, Rajshahi and Rangpur divisions, three districts from Chittagong division, four districts from Dhaka and one from Sylhet. To enhance comparability between estimates, we chose to use the same districts randomly sampled in our 2010 study. Because of their large caseload and important role in postabortion care provision, especially for patients with severe complications, all public and private medical college hospitals in all 64 districts of the country were included. All other categories of facilities were selected from the 16 sample districts. Sampling fractions were determined by MR and postabortion care caseload and absolute number of facilities, and these varied by facility type and division. We included all of the 13 district hospitals, 98 UHCs and 26 MCWCs in the sampled districts, as these types of facilities are critical sources of postabortion care. When selecting UH&FWCs into the sample, different sampling fractions were applied to each division to ensure that a sufficiently large number of this facility type was selected in all divisions. For example, 40% of all UH&FWCs were selected in the sampled districts located in Sylhet division, while only 20% of all UH&FWCs in Dhaka division were selected. Overall, 353 (31%) of the 1,152 UH&FWCs in the 16 sampled districts were selected into the sample. Some 270 private clinics were sampled using a similar approach, in which the proportion sampled varied by division and facility size. HFS respondents were senior staff members with in-depth knowledge of the services offered by their facility and the population it served. In hospitals, the respondent was typically the chief of obstetrics and gynecology; in smaller facilities, it was often a clinic director or other senior staff member. Respondents provided information on their facility’s capacity to provide MR services and postabortion care, and on their MR and postabortion care caseload. Respondents stationed at UH&FWCs received a modified questionnaire that excluded questions on postabortion care because it was not provided at UH&FWCs at the time of fieldwork. See Appendix 1 for copies of the full questionnaires in English and Bangla. The HPS was designed to obtain the opinions and perceptions of a sample of experts highly knowledgeable about the provision of MR, postabortion care and illegal induced abortion services in Bangladesh. Unlike the HFS, the HPS did not employ random sampling; instead, it used a purposive sample of 322 clinicians, policymakers, researchers, and advocates, who were selected from all seven divisions and 36 of the 64 districts of Bangladesh. Prospective respondents were identified by the Association for Prevention of Septic Abortion, Bangladesh (BAPSA), which conducted fieldwork for this study. The overwhelming majority of the sample (84%) were health care providers; the remaining 16% were program managers, clinic directors or policymakers with experience in the area of abortion and MR service provision in Bangladesh. On average, respondents had more than 19 years of experience in the field and were working at the time of the survey in a variety of settings: 60% in the public sector, 34% in the private sector and 6% at NGOs. Though a majority of respondents worked in urban areas, 23% had at least six months’ experience working in rural areas in the five years prior to the survey. In face-to-face structured interviews, experts were asked to provide estimates of measures related to the conditions under which women obtain induced abortion and to assess ways in which these conditions vary according to major characteristics likely to affect women’s access to health care: socioeconomic status (poor or nonpoor) and area of residence (urban vs. rural). Indicators that were of particular interest included the proportion of women experiencing health complications from induced abortions, the proportion of those women who would receive care at a health facility and the estimated cost to women of obtaining an induced abortion from various sources. We collected 2014 division-level service statistics from the central offices of all major NGOs† providing MR services in the country. For each of these organizations, we collected the number of MR procedures performed and the number of patients treated for abortion complications, by division. Questionnaires and survey methodology were approved by the Guttmacher Institute’s federally registered institutional review board, the Bangladesh Medical Research Council and the NGO Affairs Bureau. Prior to being interviewed, each HPS and HFS respondent was read a consent form and given the opportunity to decide whether to participate in the study. Each consent form addressed why the respondent was selected, the purpose of the questionnaire, the approximate interview duration, reassurance that all of the information provided by the respondent would be treated confidentially and only presented in aggregate, and the potential benefits and risks of participation. No respondent was interviewed for both the HFS and the HPS. All information collected was aggregate facility-level data; no patient-level information was collected. Survey fieldwork took place in September–December 2014. Survey activities were led by two study coordinators, the director and deputy director of training and research at BAPSA, who closely monitored a field staff consisting of 12 research assistants and two quality control officers. After two weeks of training, the staff was organized into two teams, managed on a day-to-day basis by the team’s assigned quality control officer. Research assistants carried out all interviews, with the exception of selected senior professionals at tertiary-level hospitals, who were interviewed by quality control officers. Once fieldwork began, the study coordinators managed all survey logistics and periodically visited the field to assure the quality of data collection and to liaise with local government officials and hospital and clinic authorities. After the completion of each portion of assigned fieldwork, the full field staff met to discuss any problems that arose during the data collection process and to offer solutions and improvements for subsequent field activities. All analyses of the HFS used the survey command prefix in Stata 14.0 to adjust for the complex sample design of the survey. Facility-level survey data were weighted based on the probability of selection into the sample and percentage of nonresponses, by division and facility type, to produce nationally representative estimates. The weighting factor for a given category of facilities was the inverse of the product of its sampling fraction and the response rate. As the HPS is a purposive sample of key informants, these results were not weighted; instead, all results presented from this survey are simple descriptive tabulations. HFS respondents were asked to estimate the number of postabortion care and MR cases treated at their facility in an average month and in the past month; at each facility, these numbers were then averaged and multiplied by 12 to produce an annual estimate of postabortion care and MR caseloads at that facility. Respondents at UH&FWCs were also asked to estimate the number of MRs provided outside of the facility at which they were based (because paramedics often provide services at their own home, at a client’s home or under other nonfacility circumstances7). Previous research has found that providers often underreport the number of MRs they provide; procedures performed outside of health care facilities and or for which providers collect a fee are particularly underreported.8,9 MRs performed at UH&FWCs and private clinics may be particularly prone to underreporting, given limited supervision at these lower-level facilities; anecdotal information indicates that an important motivation for underreporting is to avoid reporting the income received from these services. In order to maintain comparability between estimates from 2010 and 2014, we used the same adjustments for underreporting as were employed in Singh et al. 2012: 40% for UH&FWCs, 25% for private facilities and 15% for all other public facilities.4 These adjustments are likely somewhat conservative; previous work has found that in some areas, the underreporting of MR procedures to the government health system is as high as 70%,10 although we expect somewhat better reporting in the context of a confidential survey such as the HFS. The universe from which we drew the sample of facilities for the HFS was identified using the most current lists of public and private facilities available from the offices of the Directorate General of Health Services and the Directorate General of Family Planning.‡ The representativeness of our sample and the accuracy of the calculated sample weights is dependent on the extent to which these lists are complete, although there were likely only a small number of changes (i.e., closure, relocation or opening of facilities) between finalization of the list and the start of fieldwork. It is important to emphasize that the data collected are only representative of the year 2014; they are the most recent statistics available at the time of publication, but do not necessarily represent current conditions in Bangladesh. Given the absence of reliable facility-level records, we consider these nationally representative estimates, based on the in-depth knowledge of senior facility staff, to be the most complete sources of information available. Though every effort was made to minimize potential for error, the fact that the data are estimates must be considered when interpreting the findings. Because the HFS is a sample survey, its data have a margin of sampling error. In addition, their accuracy relies on respondents’ knowledge of the services offered and the populations served at each facility. It is also important to note that the provision of MR services is considerably underreported, and there is a dearth of data documenting the extent to which this underreporting occurs. We adjust for underreporting using approximate figures from previous work,6 but these adjustments may be somewhat conservative. It is also possible that some facilities (especially private clinics) that did not report any MR provision may actually provide MR services but chose not to disclose this information due to stigma or questions of legality. If this is the case, our findings may underestimate the proportions of facilities providing MR. Adjustments for underreporting (including among private clinics) would, at least to some extent, take into account the impact on the number of MRs provided annually. We use a limited set of measures from the HPS survey on the conditions of induced abortion and complications: the proportion of women who receive care for complications among those that need it and the estimated costs of induced abortion by provider type. The HPS survey represents experts’ estimates and observations, and provides a rough description of induced abortion conditions in the country; measures from this source should be treated not as empirical estimates but as approximations. Finally, as previously mentioned, this study takes a health system perspective. We did not interview women seeking services, and their experiences may differ from the reports by health facilities presented in this analysis. Where possible, we incorporate findings from previously published qualitative work on women’s own experiences with MR services and postabortion care, but more qualitative and quantitative research is needed on women’s own perspectives of quality of care and barriers to access in Bangladesh. Menstrual regulation: According to the government of Bangladesh, menstrual regulation (MR) is a procedure to regulate the menstrual cycle when menstruation is absent for a short duration; it is performed in a health care facility by a trained provider within a set number of weeks since a woman’s last menstrual period (this time period varies by provider type and method). Some trained family welfare visitors and paramedics provide MRs on an unofficial basis outside of facilities or in women’s homes, and we also classify and count these as MR procedures. Menstrual regulation with medication: Menstrual regulation with medication (MRM) uses a regimen of mifepristone and misoprostol, distributed by a trained medical provider affiliated with a health care facility and within the authorized number of weeks LMP. At the time of fieldwork, only physicians were authorized to provide MRM; family welfare visitors and SACMOs had not yet been trained and so were not yet permitted to provide this procedure. Induced abortion: In the context of these analyses, induced abortion is the termination of a pregnancy by a procedure or action taken by a provider or a woman herself, outside of the definitions of MR or MRM above. This includes (but is not limited to): procedures completed outside of a health facility (except in the instances described above in the definition of MR), procedures completed beyond the time frame allowed for MR; and procedures completed using medication—mifepristone and misoprostol in combination or misoprostol alone—distributed outside of a health care facility, without the guidance of a trained medical provider. Postabortion care: Postabortion care encompasses a range of services offered to women experiencing complications following miscarriage and induced abortion. For the purposes of this study, we focus on the number of women treated and the contraceptive counseling and services provided to them, and we discuss some information on the types of complications for which women receive care and the main procedure used to treat them. Aspects of comprehensive postabortion care that are not addressed in this report include details on medical conditions on admission, clinical treatment provided, and counseling and services related to HIV and other STIs. Previous work suggests women in Bangladesh face a range of barriers when seeking MR services. Although MR has long been officially permitted and provided free of charge at government facilities, many women have reported being unaware that the service is authorized and available. In fact, a national survey found that in 2014, more than half of ever-married women in the country said they had never heard of MR (compared with 30% in 2011).18,19 Other documented barriers include limited provision by health facilities, providers’ unsanctioned rejection of women seeking services and unauthorized charging for services, judgmental attitudes on the part of providers, and stigma and shame surrounding the procedure.5,7,9,11,20,21 It is unclear, however, which barriers to MR remain and how service provision has changed over time, since the recent steps the government has undertaken to improve access and quality of care. The findings we present below from the HPS and HFS provide insights into the remaining barriers to access, as well as trends in service provision since 2010. The number of MRs provided in Bangladesh declined by about a third from 2010 to 2014, from 653,000 to 430,000 (Table 2); the rate of MRs, which accounts for population growth, declined by 40% (from 17 to 10 per 1,000 women aged 15–49; not shown). Dhaka, Barisal and Khulna all had rates similar to the national average (Figure 1); in contrast, rates were higher than the national average in Rangpur (13), Rajshahi (12) and Sylhet (11). At 7, Chittagong’s rate was lower than the national average. Declines cut across almost all facility types. MR provision by NGOs declined by 16% (from 180,200 to 150,700), while the number of MRs provided by private clinics declined by 42% (from 59,800 to 34,600) and the number provided by public hospitals declined by 36% (from 14,100 to 9,100). UH&FWCs had the sharpest decline, at 54% (from 301,600 to 138,300). In contrast, the number of MRs provided at other public facilities (MCWCs and UHCs), stayed fairly constant, at about 97,400 cases, in both 2010 and 2014. These differential declines led to a substantial shift in which types of facilities performed the majority of MR services in the country. In 2010, UH&FWCs provided close to half of all MRs (46%); by 2014, they performed 32%. In contrast, an increased proportion of MRs were performed at other small public facilities (15% in 2010 and 23% in 2014) and NGOs (28% and 35%, respectively). The share of MRs performed by public hospitals (2%) and private facilities (8%), however, remained small and stable. Declines in average annual MR caseloads were seen across all facility types from 2010 to 2014, and the largest declines were at public hospitals (542 to 232) and UH&FWCs (152 to 95). Smaller declines were seen at UHCs and MCWCs (220 to 208) and private facilities (110 to 101). Similar to 2010, public hospitals and other public facilities had the highest annual caseloads in 2014, followed by private facilities and UH&FWCs. Fewer than half (42%) of all facilities in the public and private sectors that could potentially provide MR services (based on the category of facility and government guidelines) actually did so in 2014 (Table 2). This proportion was quite low among private clinics (20%) and highest among UHCs and MCWCs (84%). The overall proportion of public and private facilities providing MR represents a substantial decline from 2010, when almost three-fifths of facilities (57%) reported providing the service. This decline was particularly steep among UH&FWCs (from 63% to 48%) and private clinics (from 36% to 20%); in contrast, the proportion of UHCs and MCWCs that provided MR remained largely stable over the four-year period (86% to 84%). Similar trends were seen in estimated weighted counts of facilities providing MR, which take into account small changes in the total number of facilities in the country between 2010 and 2014. Trends in the proportion of NGO facilities (and weighted counts of those facilities) that provide MR are unknown, as they were not included in the HFS in either 2010 or 2014. The decline in the proportion of UH&FWCs providing MR services deserves particular attention, as these facilities are responsible for a large share of MR services in the country. These facilities are typically located in rural areas where there are few other options for care: Out of the more than half of UH&FWCs that did not provide MR, 84% reported there were no other providers of MR nearby (not shown). The decline in the proportion of UH&FWCs providing MR was seen across all divisions, and the greatest decreases were in Dhaka (from 58% to 39%; not shown), Chittagong (75% to 53%) and Khulna (33% to 24%). These declines seem largely driven by an increase in the proportion of providers who reported never having provided MR (from 10% to 26%); in contrast, the proportion of providers who used to but no longer provide MR remained unchanged from 2010 to 2014 (26%; Table 3). The declining proportion of UH&FWCs that offer MR may also be due to a shift in the underlying characteristics of the providers stationed at these facilities. Recent efforts to recruit a new cohort of family welfare visitors and paramedics appear to have skewed the population of these providers to a younger age profile: In 2014, 12% of providers interviewed at UH&FWCs were aged 20–29, up from only 1% in 2010 (Table 4),§ and the vast majority (95%) of this younger cohort did not provide MR in 2014 (not shown). In contrast, 55% of family welfare visitors or paramedics aged 40 or older reported providing MR, as did 30% of those aged 30–39. Respondents at UH&FWCs that did not provide MR were asked their reasons for not doing so. Thirty-nine percent in 2014 reported lack of training, 38% said they did not like to perform MR (with no reason specified), and 33% reported religious or social reasons (Figure 2). Beliefs related to personal health, lack of support staff and lack of space at facilities were much less frequently mentioned, and almost no respondents (4%) cited insufficient equipment or supplies as a reason for not performing MR. There was a large increase from 2010 to 2014 in the proportion of respondents who cited a lack of training as a reason for not providing MR (from 8% to 39%), and this reason was most common among the youngest respondents (92% of 20–29-year-olds vs. 59% of 30–39-year-olds and 19% of those aged 40 or older; not shown). In part, this may be because many of these younger providers were newly posted at their facilities at the time of fieldwork, and so may have had less exposure to in-service training; if this is the case, it is likely that the proportions providing MR will increase over time. In contrast, much higher proportions of older respondents than younger ones cited religious or social reasons for not providing MR (45% of those aged 40 or older vs. 26% of 30–39-year-olds and 0% of those aged 20–29) and cited that they did not like to provide MR (47% of those aged 40 or older, 31% aged 30–39 and 10% aged 20–29). At all types of public and private facilities authorized by the government to provide MR, the HFS gathered information on whether facilities had necessary equipment and trained staff. (Because of their smaller size, UH&FWCs were given an abbreviated questionnaire, without questions on equipment or staff training; thus they are excluded from these measures.) More than two-thirds of facilities reported that they had both functional manual vacuum aspiration equipment and staff trained to perform MR (Table 5). However, only 51% of these facilities actually provided MR. This gap between a facility’s ability to provide MR and its actual provision of the service was especially large among private clinics, which were also the least likely to report having equipment and trained staff overall: Sixty-three percent of private facilities reported having both the equipment and trained staff to provide MR, and only about one-third of these facilities actually did so. The gap was very large among hospitals, as well—74% had both equipment and trained staff, but only 40% provided MR. However, many public medical college hospitals house MR-providing NGOs on their premises and therefore may be considered to be providing the service. Much larger proportions of UHCs and MCWCs reported having equipment and trained staff (94%), and almost all of these facilities reported providing MR (90%). The HFS also collected information from all facilities on whether they had the national MR guidelines, which were released in early 2014 and set standards for MR counseling, follow-up care and contraceptive provision. Since the guidelines were finalized and distributed only a month before the start of fieldwork, we expected the guidelines would not have reached all providers and facilities before they were surveyed. Given this context, the proportion of all facilities that reported having a copy of the guidelines was not insubstantial (27%), although it was particularly low at private facilities (6%). Public hospitals and UH&FWCs were the most likely to have the national MR guidelines (46% and 48%, respectively). In mid-2014, after several studies showed the feasibility and acceptability of the procedure in Bangladesh,15,22 the Ministry of Health and Family Welfare formally approved the provision of MR using a dual regimen of mifepristone and misoprostol up to nine weeks post-LMP.14 This method is known within the MR program as MR with medication, or MRM. Although the method had only been recently approved at the time of fieldwork, about one-fifth of all facilities providing MR reported using MRM (Table 6). This proportion varied by facility type, ranging from as few as 10% of MCWCs and UHCs to 61% of public hospitals; 30% of private facilities offered the method. It is important to note that the proportion of facilities that provided MRM was comparatively low among MCWCs and UHCs because most MR services at UHCs are provided by maternal and child health units located in the same facility; these units are staffed by family welfare visitors and paramedics, who were not approved to provide MRM at the time of fieldwork. Among facilities that did provide MRM, manual vacuum aspiration was the method used most often for MR, accounting for around three-fifths of procedures. MRM was used in more than a third of procedures at these facilities (37%), while the use of electric vacuum aspiration was extremely rare (2%). An estimated 27% of all women seeking MR at public and private facilities were refused that service in 2014 (Table 7), a proportion that was largely unchanged from 2010 (26%). ** The proportion rejected was fairly similar across facility types, ranging from 24% at UH&FWCs to 32% at UHCs and MCWCs. Overall, only 11% of facilities providing MR reported that they did not reject any women seeking the service in 2014—that is, the large majority of these facilities refused to provide MR at least some women. Private clinics were the least likely to reject women (17% refused no one), but even so, more than four-fifths turned away some clients. Facilities gave a variety of reasons for refusing women MRs. 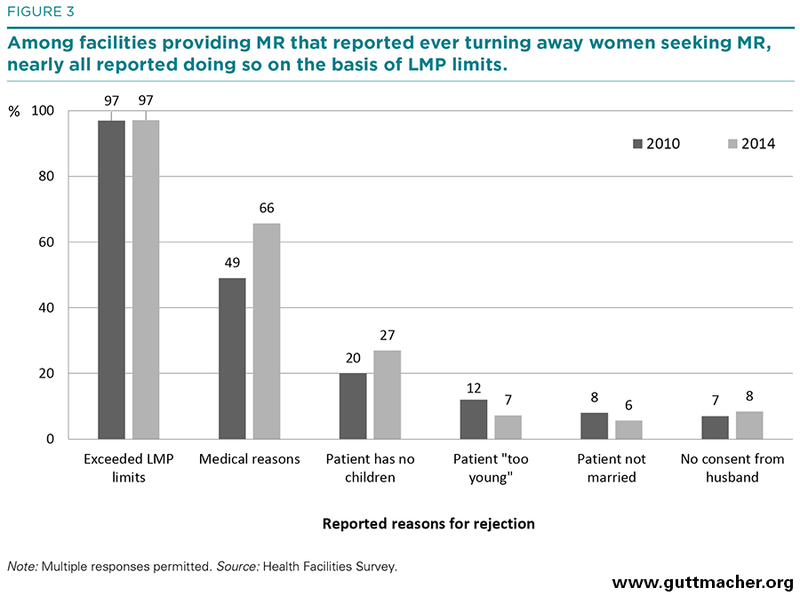 Almost all facilities that rejected some women said they commonly did so because the LMP limits had been exceeded (97%), and 66% cited unspecified medical reasons (Figure 3). Some reasons given were related neither to published government guidelines nor medical concerns: Twenty-seven percent of respondents said their clinic refused to perform MRs because the client was childless, 7% because they considered the client too young, 8% because of lack of consent from the woman’s husband and 6% because the client was unmarried. These proportions were largely unchanged from 2010, although the proportion of facilities rejecting women for medical reasons increased somewhat (from 49% to 66%), as did the proportion doing so because clients had no children (20% to 27%). In contrast, the proportion rejecting women for being too young declined, from 12% to 7%. The high proportions of facilities reporting that they commonly refuse to perform MRs because women had exceeded the maximum number of weeks post-LMP may point to a lack of awareness among women (established in previous qualitative work20,21) that there is a specific window of time after a missed period during which MR is permitted. Almost all respondents to the HFS (92%) agreed that a lack of knowledge of LMP limits among women is a major barrier to women obtaining MR (Table 8). Among surveyed facilities that offered MR services in 2014, contraceptive counseling was provided to almost all MR patients (99% on average; Table 9). However, provision of contraceptive methods was much lower. On average, facilities reported providing methods to only 37% of MR patients. Public hospitals and other public facilities reported providing contraceptive methods to substantially higher proportions of MR patients (79% and 76%, respectively), while private facilities provided them to only a small minority (7%). Although not all women obtaining MR services desire a contraceptive method, the overall proportion receiving one is still relatively low. Differences in question wording do not allow direct comparisons between the 2010 and 2014 surveys on the average percentage of women receiving a method; however, it is possible to compare the proportion of facilities that routinely provided contraceptive methods to all MR patients, and results show that this proportion appears to have increased modestly over the four-year period, from 26% to 36% (not shown). 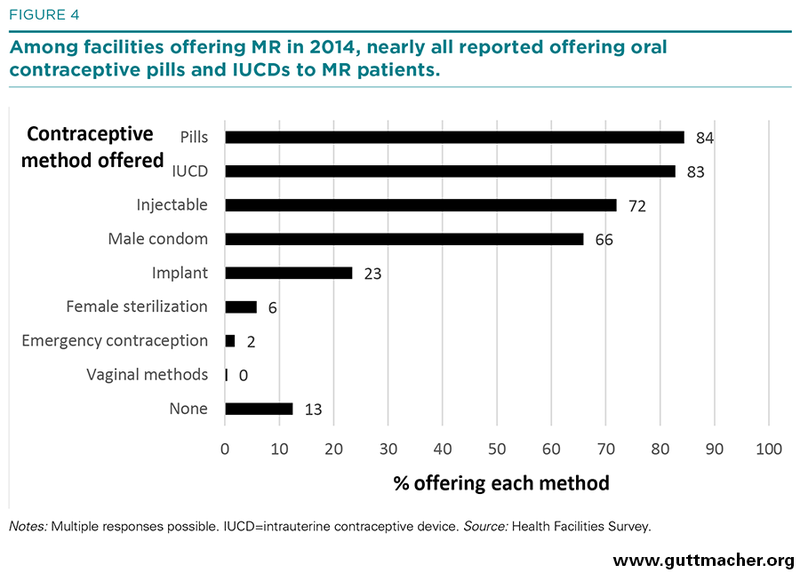 Among facilities providing MR in 2014, the most common contraceptive methods supplied to MR patients were pills, intrauterine contraceptive devices, injectables and condoms (Figure 4). Fewer facilities routinely offered implants, sterilization (male or female), emergency contraceptive pills (for later home use) or vaginal barrier methods, and 13% reported providing no contraceptive methods to MR patients. Despite the successes of the MR program, clandestine abortion remains a serious health problem in Bangladesh. In 2014, there were an estimated 1,194,100 induced abortions in Bangladesh,6 many of which were provided in unsafe conditions or by untrained providers. There is increasing awareness that abortions worldwide can be placed along a gradient of safety: Not all clandestine abortions result in complications, and complications that do result can range from mild to severe, depending on the methods used and conditions under which the abortion is provided.23 In many settings, including Bangladesh, misoprostol and other abortifacient drugs are widely available in pharmacies and other informal settings.7,16,17 Misoprostol can be used to safely induce abortion when used correctly, and complications from misoprostol-induced abortions are often less severe than those from more invasive methods.23 Nonetheless, overall, clandestine abortions can result in serious health, economic and social consequences that affect women—and society—in both the short and long term. The extent to which women are able to mitigate or avoid these consequences depends, in part, on how safe an abortion they can obtain; it also depends on their access to postabortion care and the quality of care provided. Responses to the HFS and HPS provide new insights regarding levels and trends in morbidity from induced abortion in Bangladesh, as well as trends in the severity of complications that women experience. The surveys also provide information on access to care, including the provision of postabortion services and barriers that women encounter in obtaining these services. According to HFS data, about 333,000 women were treated for complications of either miscarriage or induced abortion in 2014 (Table 10).†† Because of the difficulty that providers have in identifying whether postabortion patients have had a miscarriage or induced abortion—particularly in the case of incomplete induced abortions without other complications—the HFS inquired about the total number of women treated for any postabortion complication. Applying an indirect technique, we then estimated that 257,000 of these patients were treated for complications of induced abortion nationally, a rate of six per 1,000 women of reproductive age in 2014 (unchanged from 2010; not shown). The rate was below average in Chittagong (four) and above average in Khulna (eight), but it was close to the national rate in the other divisions (Figure 5). On average, facilities treated 149 cases of postabortion complications in 2014, although this number varied widely according to facility type, from 477 at public hospitals to 97 at private clinics (Table 10). UH&FWCs were not asked about postabortion care, as they were not mandated to provide such care at the time of fieldwork; although some of these facilities may have provided basic treatment at the time, almost all referred patients to higher-level facilities. These reported numbers of postabortion care cases likely underestimate the actual number of women experiencing abortion complications in Bangladesh because they account only for women who received care at a health facility. 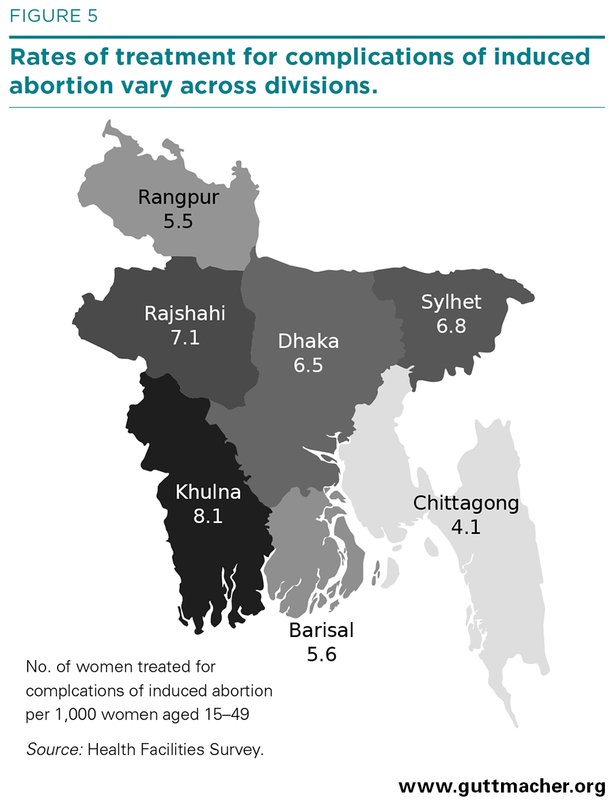 HPS respondents estimated that around one-third of all women in Bangladesh experiencing complications from unsafe induced abortion and needing care do not receive it (not shown). This proportion was perceived to vary widely by women’s area of residence and poverty status: Respondents estimated that 85% of nonpoor urban women would receive care for complications, compared with only 47% of poor rural women (Table 11). This pattern is common across many countries, and is likely attributable to nonpoor urban women’s greater ability to find and pay for both quality abortion services and postabortion care. Indeed, HPS respondents indicated that nonpoor urban women typically receive safer abortions than do their poor rural counterparts: They estimated that 25% of nonpoor urban women who had an induced abortion would go on to experience complications that required treatment, compared with 43% of poor rural women. HPS respondents were asked to estimate the cost of an illegal abortion, by provider type, for four subgroups of women (poor urban, nonpoor urban, poor rural and nonpoor rural), thus shedding light on possible financial barriers associated with seeking care from safer abortion providers. Respondents estimated that clandestine abortions provided by medical doctors were the costliest, ranging from around 1,700 Bangladesh taka (Tk), or US$21,‡‡ for poor rural women to more than Tk 5,000 (US$65) for nonpoor urban women (Table 12). In a country where the average monthly per capita income is roughly Tk 2,000 (US$25) in rural areas of Bangladesh and Tk 3,700 (US$47) in urban areas,24 these costs represent a substantial economic burden for many women. By comparison, the HPS respondents estimated that the cost of a medication abortion obtained from pharmacists or drug sellers can be substantially less, at Tk 300–500 (US$4–7). HFS results indicate that the large majority of health facilities with the capability to provide postabortion care did provide it in 2014; only 9% of such facilities did not provide postabortion care, compared with 16% in 2010 (Table 10).§§ Higher proportions of public facilities (99–100%) than private facilities (87%) provided postabortion care. The private sector accounted for almost half of all postabortion care patients treated (unchanged from 2010), public hospitals accounted for 19% (down from 26% in 2010) and NGOs accounted for 3% (unchanged from 2010). MCWCs and UHCs treated the remaining 34% of postabortion care patients (up from 28% in 2010). Providers used a range of methods to treat postabortion and post-MR complications. On average, 22% of patients were treated with manual vacuum aspiration, 44% with medication (such as misoprostol, or mifepristone and misoprostol in combination), 33% with dilation and curettage (D&C) and 1% with electric vacuum aspiration (Table 13). There was very little variation by facility type, although the proportions using D&C were slightly higher than average at private facilities (36%) and lower than average at UHCs and MCWCs (25%). HFS respondents were asked to estimate, for patients treated at their facility for complications resulting from induced abortion, MR or miscarriage, the proportion who experienced each of the main types of associated complications. Results show that the distribution of these patients according to type of complication shifted sharply from 2010 to 2014 (Table 14). In 2010, an estimated 27% of patients receiving care for complications were treated for hemorrhage; in 2014, the comparable proportion was almost double, at 48%. The estimated proportion of patients treated for incomplete abortion declined somewhat, from 66% to 56%, and the estimated proportion of patients with sepsis increased noticeably, from 2% to 6%, although the proportion with this complication remains low. The proportion of patients with cervical or vaginal lacerations and bladder injury remained fairly steady, at 2% and 1%, respectively. The dramatic uptick in the proportion of patients receiving care for complications who were treated for hemorrhage may be due to an increase in the availability and clandestine use of misoprostol; such an increase is supported by anecdotal reports. It is also possible that this increase could reflect complications from legal MRM; however, given the relatively small proportion of MRs provided with MRM and the higher clinical effectiveness of MRM (as well as better quality of care from providers trained in MRM, in comparison with a misoprostol-only regimen which is usually obtained from untrained providers) the impact from these procedures on the distribution of complications would likely be minimal. Facilities participating in the HFS that reported having provided postabortion care in 2014 were asked what proportion of their postabortion patients were treated for complications resulting from MR.*** To differentiate complications from induced abortion or miscarriage from those due to MR, we first asked providers to estimate the total number of postabortion care cases, from any cause, at their facility. We then asked them to estimate the number or proportion of complication cases in the past month that were due to MR. We subtracted this number from the total number of postabortion cases to obtain separate estimates for complications from MR and complications from induced abortion and miscarriage. Overall, these facilities reported that complications from MR accounted for about a third of their overall complication caseload. Based on this estimate, a total of 152,000 women of reproductive age are treated annually for reported MR complications (not shown). The question on which this estimate was based did not specify the type of provider (trained or untrained), the setting, or whether the procedure was surgical or medical. Therefore, although this number appears high, it most likely includes some complications from MR procedures performed by inadequately trained health personnel or in unhygienic settings, as well as some abortions induced through use of medications procured from informal-sector providers (such as drug sellers) that HFS respondents may have categorized as MR. (The latter type of provision is not formally approved by government guidelines, and thus is not considered MR under the definition we use in this report). Previous work has documented the often blurred lines between approved and unapproved MR services in Bangladesh: Some qualitative studies have found that many women are unable to distinguish between legal providers and unapproved or informal providers of MR; in addition, reports of the use of brokers to redirect women from government clinics toward private (and possibly unauthorized) sources are common.7,9,21 Although we expect HFS respondents to have greater depth of knowledge than the average patient, it is possible that their responses reflected common, as opposed to official, understanding of what constitutes MR. It is also possible that some proportion of women seeking care at a facility for complications from MRM can be attributed to inadequate counseling regarding expected MRM side effects, one of which is an extended period of bleeding. In the absence of adequate counseling, some women may arrive at health facilities with bleeding they perceived to be complications from MRM procedures but that would otherwise have resolved without medical intervention. The sharp increases from 2010 to 2014 in the proportion of postabortion patients presenting with hemorrhage (mentioned in the “Types of Complications” section above) offer some support for this hypothesis. The HFS asked about provision of contraceptive services to patients receiving postabortion care following a miscarriage, induced abortion or MR. In general, nearly all HFS respondents (99%) reported that their facility offered family planning counseling to their postabortion care patients, and that this counseling was given to a high proportion of patients receiving postabortion care (95%; Table 15). Although family planning counseling was reportedly almost universal, provision of contraceptives was not as prevalent. Only 18% of all facilities providing postabortion care routinely offered contraceptive methods to these patients, down from 34% in 2010 (not shown). The proportion varied widely by facility type: 47% among public hospitals, 41% MCWCs and UHCs, and 7% among private facilities. Notably, despite their relatively small size, 100% of MCWCs reported offering contraceptive methods to postabortion care patients (not shown). Among facilities offering contraceptive methods as part of postabortion care, the proportion of patients who received a method was uniformly reported to be high: 84%, on average. This proportion was highest (89%) at UHCs and MCWCs and lowest (74%) at the small number of private facilities that offered contraceptive methods to postabortion care patients. Our study highlights several areas where improvement is needed if all women who seek MR and postabortion care in Bangladesh are to obtain quality services and thus avoid unsafe abortion. Below, we discuss key findings and their implications for policies and programs, and offer some pertinent recommendations for future action. • Increasing the training of providers, especially newly recruited family welfare visitors. Among family welfare visitors and paramedics at UH&FWCs that were not providing MR, those who were younger overwhelmingly identified a lack of adequate training as a major reason for not providing MR, whereas the older cohort, many of whom are nearing retirement, were more likely to cite religious, personal, or social reasons for not providing the service. This apparent generational shift in attitudes represents an opportunity for the government to expand access to MR in the country by implementing refresher trainings for the newer generation of providers, potentially in collaboration with NGOs. It’s important to note that there has been increased training by the government subsequent to 2014, and so this situation may have improved somewhat; however, continued efforts in this area are warranted. • Disseminating information about the MR program at the community level. Qualitative work has shown that many women are unaware that safe and legal MR services exist,20,21 and a recent quantitative study indicates that the proportion of women who know about MR services is declining, with fewer than half of ever-married women reporting in 2014 that they had ever heard of MR.18 The HPS and other studies have found evidence suggesting that many women may be unaware that there is a set period of time within which MR is legally permitted. Even those who are aware may have inadequate knowledge about how to apply this information to their own situation.20 Efforts should seek to educate women about safe and legal MR services and about LMP limits for MR provision. • Educating providers on appropriate reasons for rejecting women seeking MR services. In 2014, one in four women seeking MR services at public and private facilities were rejected (93,000 from public facilities and 12,000 from private), for a total of 105,000 women turned away from needed services. Many of these women were rejected either for medical reasons or for exceeding the maximum weeks post-LMP, but providers also cited a range of reasons that are not included in the official criteria for MR provision. Further investments should be made to train providers on appropriate reasons for turning away women seeking MR, as well as what counseling should be provided if a woman is turned away. Our findings point to two main recommendations for improving quality of care at facilities that provide MR or postabortion care. • Improve provision of contraceptive counseling and methods for postabortion care and MR patients. Provision of family planning services is a standard component of comprehensive and high-quality postabortion and MR care. However, while most facilities reported providing contraceptive counseling to their patients, fewer provided contraceptive methods. In particular, private facilities’ provision of contraceptive services could be greatly improved: These facilities reported providing contraceptive methods to fewer than one in 10 MR patients and only 7% of private facilities routinely offered contraceptive methods to postabortion care patients. Contraceptive provision should be further integrated into postabortion care and MR services in all sectors. • Train more staff on the provision of MR with medication. MRM is a highly effective and safe procedure when administered correctly. At the time of our study, one-fifth of facilities reported that they had begun offering MRM services in the short time between the government’s approval of the method and fielding of our study. The government and some major NGOs in the country have already started MRM trainings for service providers, including the development of guidelines for MRM provision, but these efforts should be expanded on a priority basis to ensure that MR providers at all public facilities and NGOs are trained to offer this method. It is particularly important that providers are trained to give women adequate counseling on follow-up care and on side effects (given that MRM side effects often include heavy bleeding that will resolve without medical intervention). Misoprostol and mifepristone are now available over the counter from drug sellers and pharmacists in Bangladesh, and anecdotal evidence suggests that women commonly procure these medications to self-induce abortion.7,16,17 Use of both drugs combined, or of misoprostol alone, to induce abortion is an attractive option for many women because it is relatively cheap and the method may be used with privacy. The combined misoprostol-mifepristone MRM protocol is very safe and highly effective when correctly administered by a trained provider, but when women procure it from another source, they may not receive important information on dosage, timing of doses or normal side-effects. For example, a recent mystery-client survey of 331 pharmacy workers in two districts in Bangladesh found that only 7% of workers provided correct information on medication protocol and dosage, and the majority did not counsel clients on the expected process for completion of the abortion or on the possibility of serious complications requiring medical care.17 Because inadequate counseling and information is likely widespread, many women may experience real complications (typically hemorrhage) requiring care at a health facility. However with poor knowledge of the normal process of bleeding, some women who have used the method correctly may also seek care because they perceive that they have a complication. Harm-reduction approaches—such as training drug sellers and paramedics, distributing informational leaflets or posters to these informal providers, encouraging providers to refer women to formal-sector facilities and accurately labeling drug packaging in plain language—could increase the safety of this method, particularly if these strategies are supported by the government and other key stakeholders.25–27 Moreover, because the combined MRM protocol is highly effective and very safe if used correctly,28 it has the potential to reduce the negative health consequences of unsafe abortion. Given the importance of tracking the incidence of MR and postabortion care over time, the government of Bangladesh should improve the quality of its existing recordkeeping procedures for both the public sector, where a system for collecting data exists but underreporting is common, and the private sector, in which few (if any) data appear to be collected. Systematic compilation of NGO service statistics should also be an ongoing activity. This study shows the value in having MR and postabortion care estimates from different years to show change over time. Collecting consistent and comparable data on a regular basis, as well as performing ongoing monitoring of the quality of services provided, would improve the government’s ability to identify gaps or problems in the health system that affect provision of these important services. Although unmet need for contraception in Bangladesh has declined over the past two decades, it is still fairly high (12% in 2014), and unintended pregnancies are common.18 The unintended pregnancy rate in Bangladesh in 2014 was an estimated 67 per 1,000 women of reproductive age,6 which is relatively high in comparison with the most recent estimates for 2012 for South-Central Asia (48), although low compared with Pakistan (93).29,30 Greater efforts should be made by the government as well as public, private and NGO providers to improve access to a wide variety of contraceptive methods and the counseling needed to help women and men prevent unintended pregnancies and achieve their preferences in terms of timing and number of births. *Family welfare visitors now offer limited care for postabortion complications at selected facilities; at the time of fieldwork, however, this type of care was not provided at UH&FWCs. †The 15 organizations are the Ahsania Mission Bangladesh; Association for Prevention of Septic Abortion, Bangladesh; Bangladesh Association for Voluntary Sterilization; Bangladesh Women’s Health Coalition; Family Planning Association of Bangladesh; Khulna Mukti Seba Sangstha; MAMATA Chittagong; Marie Stopes Bangladesh; Nari Maitree; Population Services and Training Center; Progoti Samaj Kallyan Prothisthan and Poribar Porikalpana Sangstha (PSKP & PPS); Reproductive Health Services Training and Education Program; Resource Integration Center; Srijani Bangladesh; and Unity Through Population Services. ‡All lists were compiled or updated in early 2014, just prior to the selection of the sample and start of fieldwork. §Because only one family welfare visitor or paramedic was interviewed at each UH&FWC, the sample from which respondent characteristics were estimated may not be nationally representative, and these general estimates should be interpreted with caution. However, any effect should be minimal, as very few UH&FWCs reported having more than one provider on staff (8% in 2010). **HFS respondents were asked, “How many women in the past month were rejected for MR services at this facility?” If they were unable to provide a number, they were then asked: “What percentage of all women who sought MR services at this facility were rejected?” If they gave a percentage, the number of women rejected was calculated based on the MR caseload of the facility. The percentage of women rejected was then calculated by dividing the number of women rejected by an estimate of the number of women seeking MR (the sum of the number of MRs provided, adjusted for underreporting, and the number of women rejected). ††This number excludes women who were treated for complications resulting from MR (see section subhead “Estimated Complications from MR” for details on how these numbers were estimated). ‡‡Based on the average annual exchange rate in 2014, Tk 1=US$0.0127. §§UH&FWCs, which are not expected to provide this care, were excluded from this measure. 1. Government of the People’s Republic of Bangladesh, Penal Code, 1860, as adopted by the Bangladesh Laws Revision and Declaration Act of 1973. 2. Directorate General of Family Planning, Bangladesh National Menstrual Regulation Service Guidelines, 2014, Dhaka, Bangladesh: Directorate General of Family Planning and World Health Organization (WHO) Country Office for Bangladesh; and Amsterdam: Kingdom of the Netherlands, 2014. 3. Akhter H, Current status and access to abortion: the Bangladesh experience, in: Klugman B and Budlender D, eds., Advocating for Abortion Access: Eleven Country Studies, Johannesburg, South Africa: Women’s Health Project, School of Public Health, University of the Witwatersrand, 2001. 4. Singh S et al., The incidence of menstrual regulation procedures and abortion in Bangladesh, 2010, International Perspectives on Sexual and Reproductive Health, 2012, 38(3):122–132. 5. Vlassoff M et al., Menstrual Regulation and Postabortion Care in Bangladesh: Factors Associated with Access to and Quality of Services, New York: Guttmacher Institute, 2012. 6. Singh S et al., The incidence of menstrual regulation procedures and abortion in Bangladesh, 2014, International Perspectives on Sexual and Reproductive Health, 2017, 49(1). 7. Hashemi A, Rashid S and Rashid M, Where do women go and why? Understanding the barriers to safe MR services in Bangladesh, unpublished manuscript, Dhaka, Bangladesh: James P. Grant School of Public Health, BRAC University, 2012. 8. Huda FA et al., Strengthening Health System Capacity to Monitor and Evaluate Programmes Targeted at Reducing Abortion-Related Maternal Mortality, Dhaka, Bangladesh: International Centre for Diarrhoeal Disease Research, Bangladesh (icddr, b), 2010. 9. Chowdhury SNM and Moni D, A situation analysis of the menstrual regulation programme in Bangladesh, Reproductive Health Matters, 2004, 12(24, Suppl.):95–104. 10. Unpublished data from Bangladesh Association for Prevention of Septic Abortion, Dhaka, Bangladesh, 2012. 11. Oliveras E et al., Situation Analysis of Unsafe Abortion and Menstrual Regulation in Bangladesh, Dhaka, Bangladesh: icddr, b, 2008. 12. Population Control and Family Planning Division, Government of the People’s Republic of Bangladesh, Memo No. 5-14/MCH-FP/Trg.79, Dhaka, Bangladesh: Population Control and Family Planning Division, 1979. 13. Proceedings of the 62nd Meeting of the National Technical Committee of Directorate General of Family Planning, June 30, 2014. 14. Directorate General of Family Planning, Government of the People’s Republic of Bangladesh, Memo No. DGFP/MCH-S/NTC-4/138/95 (Part-05)/34: Agenda - 4, Dhaka, Bangladesh: Directorate General of Family Planning, 2014. 15. Alam A et al., Acceptability and feasibility of mifepristone-misoprostol for menstrual regulation in Bangladesh, International Perspectives on Sexual and Reproductive Health, 2013, 39(2):79–87. 16. Banu N and Akhter QS, An observational study on use of misoprostol in termination of unintended pregnancy in a rural setting, Journal of Dhaka Medical College, 2010, 19(2):109–114. 17. Huda FA et al., Availability and provision of misoprostol and other medicines for menstrual regulation among pharmacies in Bangladesh via mystery client survey, International Journal of Gynecology & Obstetrics, 2014, 124(2):164–168. 18. National Institute of Population Research and Training (NIPORT), Mitra and Associates, and ICF International, Bangladesh Demographic and Health Survey, 2014, Dhaka, Bangladesh: NIPORT and Mitra and Associates; and Rockville, MD, USA: ICF International, 2016. 19. NIPORT, Mitra and Associates, and ICF International, Bangladesh Demographic and Health Survey, 2011, Dhaka, Bangladesh: NIPORT and Mitra and Associates; and Calverton, MD, USA: ICF International, 2013. 20. Hossain A et al., ‘How shall we survive’: a qualitative study of women’s experiences following denial of menstrual regulation (MR) services in Bangladesh, Reproductive Health, 2016, 13(1):86. 21. Khan R et al., Menstrual Regulation: A Decision Tainted with Stigma, Pain and Suffering—An Anthropological Study, Dhaka, Bangladesh: Embassy of the Kingdom of the Netherlands, Marie Stopes Bangladesh, and icddr, b, 2016. 22. Hena IA et al., Introducing Medical Menstrual Regulation in Bangladesh: MRM Final Report, Dhaka, Bangladesh: Population Council, 2013. 23. Sedgh G et al., Insights from an expert group meeting on the definition and measurement of unsafe abortion, International Journal of Gynecology & Obstetrics, 2016, 134(1):104–106. 24. Bangladesh Bureau of Statistic (BBS), Population & Housing Census 2010: Preliminary Results, Dhaka, Bangladesh: BBS, 2010. 25. Briozzo L et al., A risk reduction strategy to prevent maternal deaths associated with unsafe abortion, International Journal of Gynecology & Obstetrics, 2006, 95(2):221–226. 26. Coeytaux F et al., Facilitating women’s access to misoprostol through community-based advocacy in Kenya and Tanzania, International Journal of Gynecology & Obstetrics, 2014, 125(1):53–55. 27. Erdman JN, Access to information on safe abortion: a harm reduction and human rights approach, Harvard Journal of Law & Gender, 2011, 34:413–462. 28. WHO, Safe Abortion: Technical and Policy Guidance for Health Systems, second ed., Geneva: WHO, 2012. 29. Sedgh G, Singh S and Hussain R, Intended and unintended pregnancies worldwide in 2012 and recent trends, Studies in Family Planning, 2014, 45(3):301–314. 30. Sathar Z et al., Induced abortions and unintended pregnancies in Pakistan, Studies in Family Planning, 2014, 45(4):471–491. This report was written by Isaac Maddow-Zimet, Meghan Ingerick, Michael Vlassoff and Susheela Singh, all of the Guttmacher Institute, and Altaf Hossain and Hadayeat Ullah Bhuiyan, both of the Association for Prevention of Septic Abortion, Bangladesh (BAPSA). It was edited by Haley Ball, of the Guttmacher Institute. The authors thank the following individuals for their comments on an early draft: Jahiruddin Ahmed, independent consultant; Halida Akhter, NGO Health Service Delivery Project (NHDSP); Kamal Kanti Biswas, Ipas; Heidi Johnston, independent consultant; Rasheda Khan, icddr,b; Sabina Faiz Rashid, BRAC University; Mohammed Sharif, Directorate General of Family Planning; and Reena Yasmin, Marie Stopes Bangladesh. The authors thank the Directorate General of Family Planning and the Directorate General of Health, Government of the People’s Republic of Bangladesh, for their support and approval of the study. The authors also greatly appreciate the contributions of the members of the Research Advisory Panel to the development of this report: Halida Akhter, NHDSP; A.K.M. Anowar Ul-Azim and M. Kabir, BAPSA; Anisur Rahman, icddr,b; Motiur Rahman, Family Planning Association of Bangladesh; Sabina Faiz Rashid, BRAC University; Ubaidur Rob, Population Council; Rafiqul Islam Sarker, National Institute of Population Research and Training; S.M. Shahidullah, Ipas; Mohammed Sharif, Directorate General of Family Planning; Pabitra Kumar Sikder, Directorate General of Health; Qurazi Suraiya Sultana, Reproductive Health Services Training and Education Program; and Reena Yasmin, Marie Stopes Bangladesh. The authors would also like to thank the fieldwork team for their assistance throughout the study, and Rubina Hussain, Guttmacher Institute, for her help with questionnaire design and fieldwork implementation. The research on which this report is based was carried out by the Guttmacher Institute and BAPSA with support from the UK Government, Dutch Ministry of Foreign Affairs and the Norwegian Agency for Development Cooperation. The findings and conclusions of the article do not necessarily reflect the positions and policies of the donors. Additional support was provided by the Guttmacher Center for Population Research Innovation and Dissemination (National Institutes of Health grant 5 R24 HD074034). The Guttmacher Institute gratefully acknowledges the general support it receives from individuals and foundations—including major grants from the William and Flora Hewlett Foundation, and the David and Lucile Packard Foundation—which undergirds all of the Institute’s work. This report is dedicated to the memory of Michael Vlassoff and to his substantial contributions to the field of sexual and reproductive health.